Fifty years after the creation of the first Alhambra® long necklace, Van Cleef & Arpels is celebrating its symbol of luck in new pieces adorned with dazzling materials. Following the association of gray mother-of-pearl and diamonds, the Maison is showcasing blue agate and introducing the technique of guillochage on yellow gold to the collection for the first time to create a radiant and luminous aesthetic. As the holiday season approaches, the new Vintage Alhambra necklaces and bracelets are revealed in a poetic and wintry universe created by Burcu & GeoKrey. The Maison is pursuing its collaboration with the two film directors – who have already brought the world of Alhambra to the screen via a brand new chapter of their film Journey of Luck. In line with Van Cleef & Arpels’ tradition of excellence, the Alhambra collection embodies all the expertise of a High Jewelry Maison. 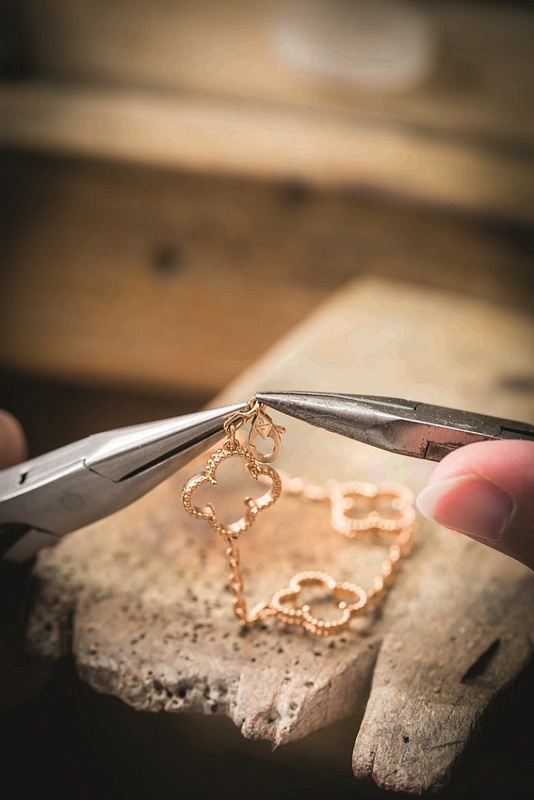 The varied skills of lapidaries, jewelers, stone-setters and polishers come together to create each piece. 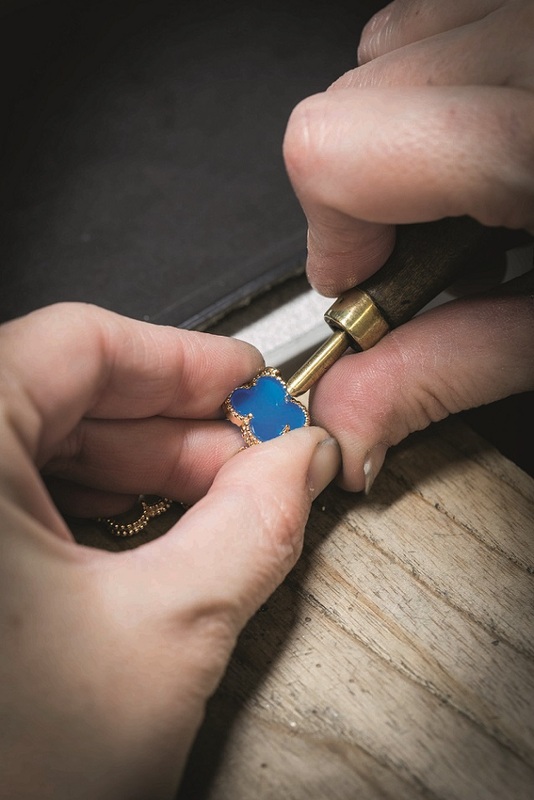 Faithful to the Maison’s high standards for hard stones, the blue agate motifs are meticulously carved and polished, before being matched to form harmonious ensembles. As with the other Vintage Alhambra creations, the guilloché yellow gold motifs are framed by an elegant beaded border. This precious surround is carefully reworked by master jewelers, before the prongs – rounded for added softness are bent down to hold the motifs in place. A final polish brings out all the luminous beauty of the ensemble. In all, no fewer than fifteen successive steps of selection, production and verification are required to create an iconic jewel that will stand the test of time. For the first time within the Alhambra collection, the Maison is introducing a traditional style hitherto reserved for its watches and precious objects: guillochage. From the 1910s, this engraving technique was used to adorn watch dials, followed in the 1930s by boxes, powder compacts and Minaudières™, with their blend of precious metal and gems. Today the Maison is drawing inspiration from their interplay of dazzling lines in a radiant guillochage on mirror-polished yellow gold. Thanks to Van Cleef & Arpels’ expertise, the depth of the incisions and their sun-shaped pattern endow the surface with a subtle relief eKect, causing the light to circulate with intensity. Embellished with this ornamentation, the motif captivates the gaze with its warm and ever-changing overtones. Following the first Journey of Luck film, which featured new Alhambra creations this spring, the second instalment takes place in a wintry atmosphere once again dreamed up by the Franco-Turkish film director duo Burcu & GeoKrey. Fluttering by night through a snowy landscape, the butterfly-clover encounters such benevolent creatures as the reindeer, the turtle and the robin. In its flight, it reveals various Alhambra creations – some of them for the very first time. To mark the 50th anniversary of the Alhambra motif, the Maison is paying homage to the beauty of the stones that have adorned it throughout its history. Blue agate, which first appeared in the collection in 1989, is thus returning to center stage for a Vintage Alhambra necklace and bracelet. Selected according to the Maison’s stringent criteria of excellence, this translucent form of chalcedony has been chosen in deep and uniform tones. Combined with yellow gold, it offers a blend of softness and radiance that evokes the subtle blue glow of twilight at the end of the day.